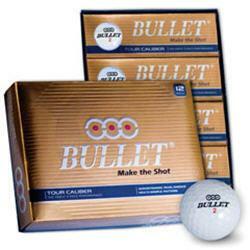 Bullet's Tour Caliber, designed for the Low Handicap and Professional Golfer boasts all of the finest qualities to get you the distance and feel you need and deserve out there! The first set I ever got were Bullets!! I never see any of their equipment in the U.S. anymore. Wouldn't mind giving these golf balls a shot though. Has no one ever played this ball?? ?